This time of year is bustling with things to do and sometimes I feel like our budget is hemorrhaging nickels and dimes. It’s cold outside and a hot meal at the end of a long day always sounds nice. Get dinner to the table in a hurry with these quick fix meals. All of the recipes below freeze well, so you could even have one prep day that lasts for a couple of weeks. They all call for ground meat, so give your feet and your wallet a break. You can often find ground beef or turkey in value size packs and break it up for several meals. Or, if you just picked up deer from the processor, venison works great too! Brown meat with onion and spices. Add beef broth and simmer about 10 minutes. Meanwhile, make sauce. Heat oil in a large skillet over medium heat; whisk in flour and chili powder to make a roux. Cook while whisking until lightly browned. Gradually whisk in tomato sauce, broth, cumin, garlic powder, onion salt, salt, and oregano. Stir until smooth, and continue simmering over medium heat about 5 minutes, or until slightly thickened. Roll enchiladas, top with sauce. Cover in plastic wrap, then foil and freeze OR top with cheese, cover in foil and bake 30-45 minutes at 350 until bubbly. Remove foil and bake an additional 10-15 minutes until cheese is melted. If frozen, thaw in fridge overnight, then bake as usual. Sweat onions and garlic over medium low in a skillet. 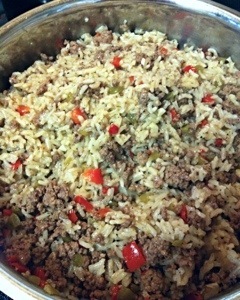 Add ground meat, salt & pepper, and brown; drain. Add all remaining ingredients to ground meat and simmer on low for twenty minutes. Serve on buns or as sliders on rolls. In a large skillet over medium-high heat and stir in the onion, green and sweet peppers, and garlic. Cook over medium heat 5-10 minutes until softened. Scoot veggies around outside of pan and add ground beef, salt, seasoned salt, and pepper to center. Cook and stir until the beef is crumbly, evenly browned, and no longer pink. Drain and discard any excess grease. Scoot the meat/veggie mixture to the edge of pan and add sausage to center. Cook until browned and crumbly. Stir in the chicken broth, sage, bay leaf, Worcestershire sauce, hot sauce, and rice. Bring to a boil over high heat, then reduce heat to low, cover, and simmer until the rice is tender, and the liquid has been absorbed, 20 to 25 minutes. Brown ground meat. Drain and cool completely. Add it to the freezer bag with the green pepper, onion, celery, garlic cloves, tomatoes, chili pepper, salt, and pepper. Lay flat & freeze. Label Bag. Trust me, if you don’t you forget and it becomes unidentifiable frozen food. Just thaw & heat! 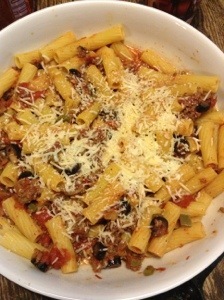 The last 30 minutes, add olives, oregano and parmesan. When it’s almost done, cook pasta according to package and drain. Add cooked pasta, 1 cup of cheese and pepperoni to the dish and mix well. Add more cheese to the top and serve! Hopefully this will get you going. Feel free to supercharge any of the above recipes by adding in shredded carrot, zucchini, or spinach. We all could use the nutrient power punch extra veggies lend a dish, not to mention the fabulous fiber. 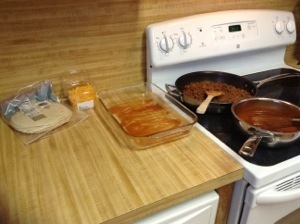 I also try to stock the freezer with browned meat for tacos, toquitos, pizza topping, or meat sauce that will come together quickly. Try pre-portioning out hamburger patties and freezing those to have on hand. Lasagna and meatloaf can also pull double duty. The next time you make one, make an extra and freeze it!